For some reason these frogs forgot how to swim. Help the frogs stay on the log. There are 4 types of frogs and each behave differently. Drag the frogs and logs (or click) with precision to save our frogs. Frog log was the Grand Prize Winner in the MIX10 10k coding challenge! The prize was ticket to the MIX10 conference(Web Design/Developer) in Las Vegas including hotel at Mandalay Bay Hotel and $1,000 visa card. 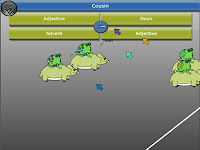 Frog log has also been featured on http://www.canvasdemos.com/2010/01/13/frog-log/ demonstrating the power of HTML5 to create html based games. I am not surprised at all that Frog Log won the hearts of my fellow judges and the Grand Prize. It’s a good idea that makes you smile when you first put your hand on it, packed with functionality and a great showcase of what you can do with a few lines of HTML5. Interesting detail: the author won a second prize last year with a Silverlight application. This proves that a great developer is great independent of the technology he actually uses. Just a great little game, addictive and well thought out with some interesting gameplay. I would LOVE to see this developed further by the author… My only ding was that drag-n-drop failed in Firefox 3.5; clicking worked fine, though. MyMouseGames placed First place in the Imagine Cup US Nation final. The imagine Cup is a worldwide software design competition sponsored by Microsoft. 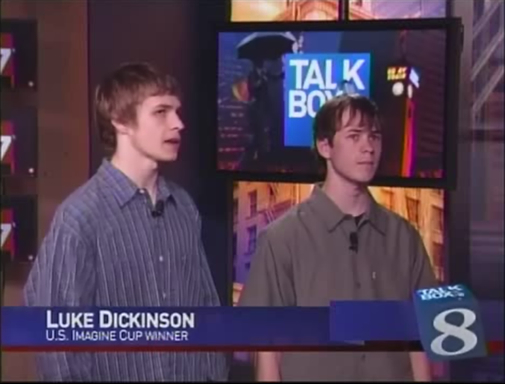 Our team – Jimmy, Mark, and Luke Dickinson (brothers) advanced from first round to semi-finals to national finals in Cambridge, Massachusetts. Our prizes was $8,000 to split among us and to continue on to the Imagine Cup World Finals in Cairo, Egypt. 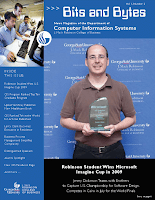 The theme of the Imagine Cup’s in 2009 was the 10 world goals of the UN, mostly helping developing countries. 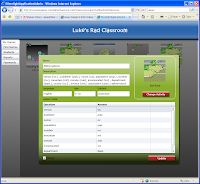 Anyway we chose to focus on education and to build it in Silverlight and ASP.NET. Basically our entry is a bunch of mini educational games that allow you multiple mice on one computer to play. The idea is one computer can work for many students. 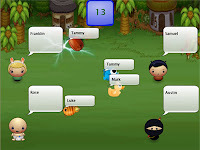 Also the teachers can change the lesson data that is being used in each game. On top of that, functioned completely though a simple web site. The purpose was to help every student have access to a computers in ill funded schools. Do you have what is takes to beat “Team Purple”? Challenge the purple team to a mini game of Football made out of 100% construction paper, but beware the purple team will be watching your every move to build better and more powerful plays to win. Note: Due to the new rule “no throwing paper” and the nature of the materials used in this game, there will be no passing plays involved. 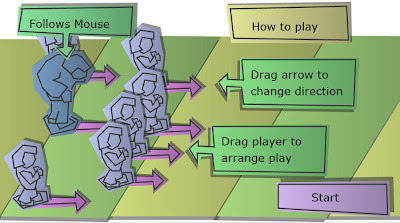 How to create a play: Drag your paper players to the desired positions. Drag the paper arrows to change the direction they will run. How to run a play: Hit the “Run Play” button to start the play. Your power player (QB) will follow the mouse during the execution of the play in real time. How to win: Score more point by the end of the game by running the ball into the touchdown area without being tackled or going out of bounds. In the event of a tie, the win will go to the previous championship holder (“Team Purple”). Frogs are attacking your hamster! The hamster has broken his running wheel in defense. 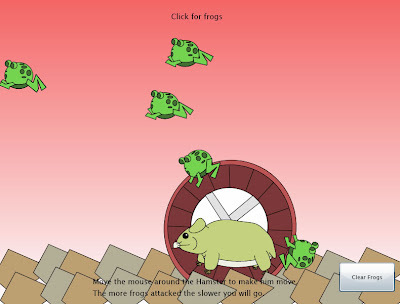 Help the hamster survive by avoiding the attacking frogs. Beware the hamster wheel will be harder to move if many frogs are hanging on. Move the mouse in a circular manner around the running wheel to help Mr Hamster out. 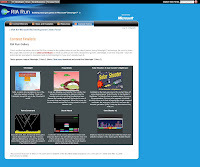 Frog Attack took first place in the RIA silverlight game contest.